It has been said time and again that fish is a health food. We, living in coastal region, have access to plenty of it and so it has been our daily diet for ages. The most common method of preparing fish in my region has been cooking it in tamarind & curry leaves based curry. Fried fish as a side dish has been the second most favored choice. It’s hard to pass a day when one of our meal doesn’t contain fish. Having said that, we do understand that in many cases, fish can be as harmful to your cholesterol levels as red meat. Shelled fishes are known to increase cholesterol count, so don’t consider yourself healthy if you eat a lot of crabs and lobsters. There are lot other fishes which are known to carry toxic elements in their body. But I am not writing this to wake your health concerns. This post is to let you know that the cook in me is still alive and cooking. I am experimenting on steamed fishes, and have been achieving better results each time. Though there are variety of fishes which can be steamed, I restrict myself to pomfret as the flesh becomes very soft after cooking. You can also steam Kingfish, mackerel and other types of fish as per your liking. ….….…Wow!! 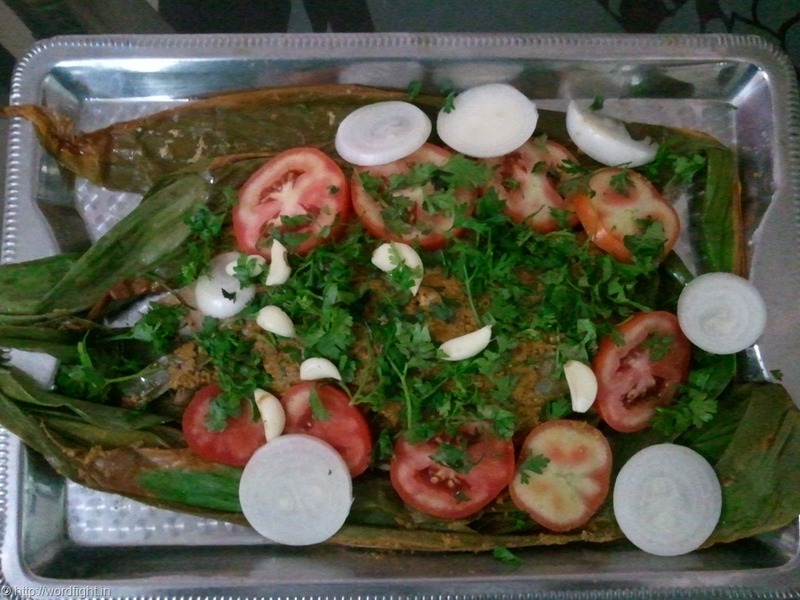 I just took a break from writing to finish off the steamed pomfret which was on the stove while I was writing. I just can’t to wait to share this recipe. Except for the pomfret, aluminum foil, the wrapping leaves and ambi haldi, mix everything in the grinder to make a smooth paste for the marinade/stuffing. Keep aside. Clean and gut out the pomfret, remove the fins and tail. Remove the mouth, eyes. There are two ways of marinating, one is stuffing and second is applying the marinade on the grooves cut on the fish. I prefer grooves, but if you need assistance on stuffing, check out this video. If you don’t want to stuff, cut deep grooves across the breadth of the fish while keeping the fishbone intact. Apply the marinade generously all over the fish and fill up the mouth cavity. Cut the ambi haldi in to thin strands and spread all over the fish. Place the fish with its marinade on the turmeric leaves or banana leaves and wrap around gently. 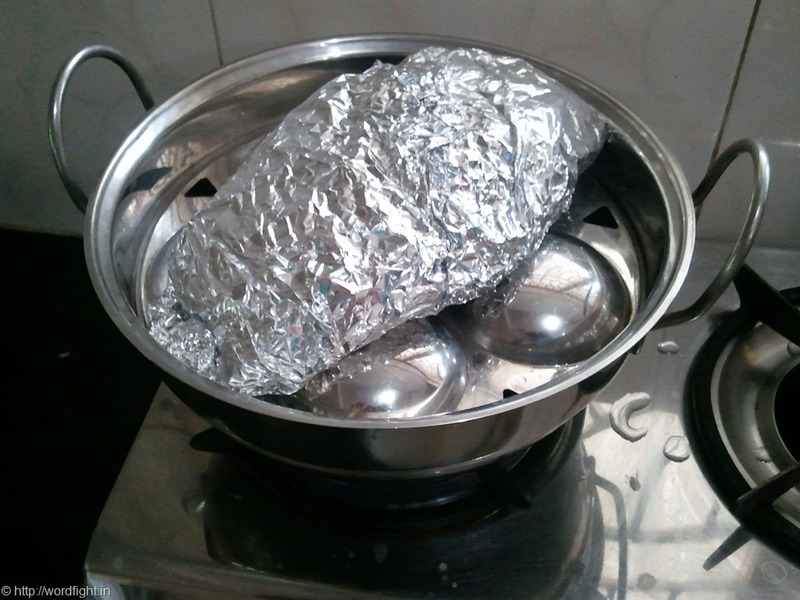 Then place this entire wrapping on aluminum foil and wrap around(aluminum foil helps in preserving the juices which might seep out of the leaves). If you don’t have the leaves, you can wrap the fish in the foil itself, but remember, the leaves impart a good natural flavor and aroma to the steamed fish. 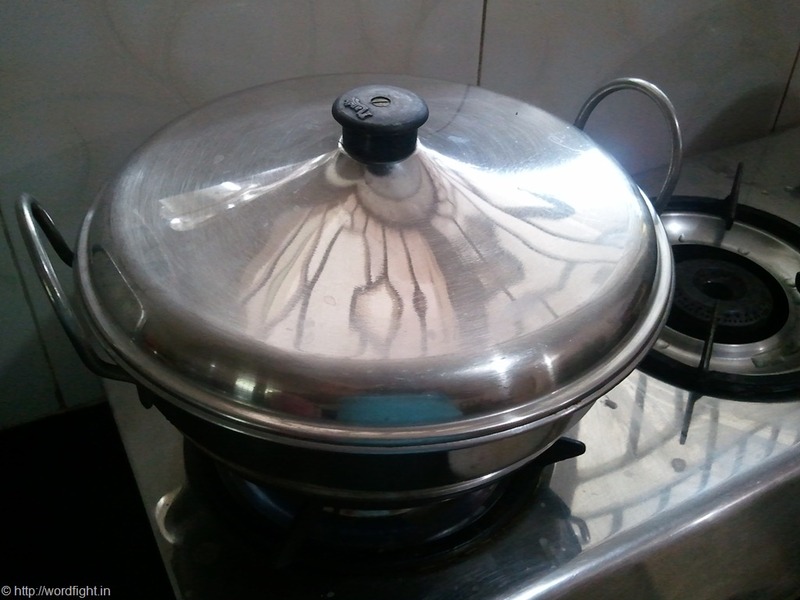 Use a traditional idli maker to steam the fish. It can even be steamed in a pressure cooker with the whistle removed. While steaming ensure that there is enough water to last for about 30 minutes of steaming on low heat, but not so much that the water enters the aluminum foil. In the traditional idli maker, you can use the idli plates to separate the fish from the water. In a pressure cooker use suitable stand which is stable and which can hold the fish. Steam the fish for about 30-35 minutes on medium heat. Garnish with fresh cilantro leaves. Serve hot. While serving, try to retain the juices that flow out of the fish. Goes well with idli, dosa, steamed rice, appam, amboli etc..